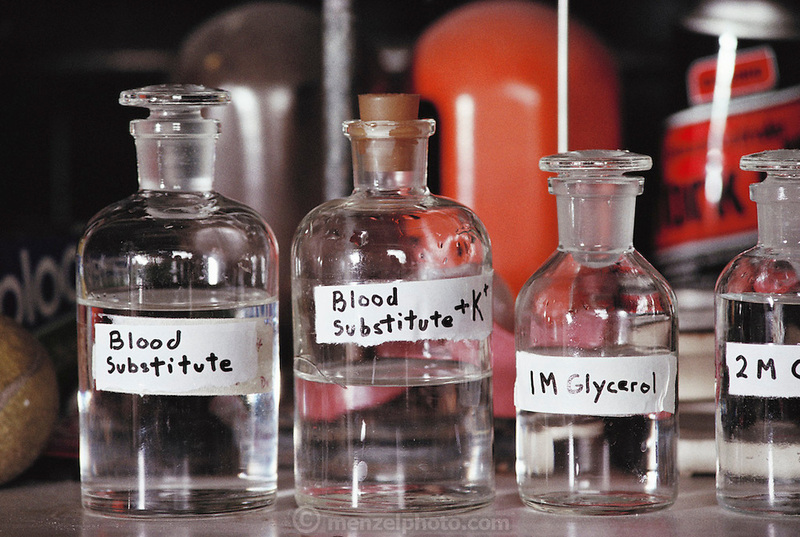 Cryonics experiments: laboratory re-agent bottles used by Paul Segall, of Berkeley, California, in his cryonics experiments that involved freezing animals after replacing their blood with a blood substitute solution, and then bringing them back to life. Cryonics is a speculative life support technology that seeks to preserve human life in a state that will be viable and treatable by future medicine. Cryonics involves the freezing of whole human bodies, organs, or pet cats & dogs, and their preservation in liquid nitrogen to await a future thaw. Cryonicists claim that medical science in the future may offer a cure for cancer or the restoration of youth, and that their methods of preservation might offer some people an opportunity to benefit from these advances. Conventional cryobiology methods for freezing organs (for organ transplants, for example) are plagued by problems of intracellular ice crystal formation, which destroys organs. 1988..